Tom Jenkins Original Bar-B-Que Sauce is now available in a new plastic, easy to carry bottle. We replaced the old glass bottle with a new design that is lighter, allowing for more control when pouring the delicious taste on your ribs or chicken. When shopping at your local grocer, be sure to look for Tom Jenkins Original Bar-B-Que Sauce in its new bottle. Tom Jenkins Bar-B-Que is truly a taste you’ll never forget and has become a sauce you’ve been telling others buy an essay online about. Tom Jenkins Bar-B-Que has been recognized as one of southeast Florida’s 500 Best Places to Dine by the Great Florida Restaurant Guide as well as one of the Best Cheap Eats in South Florida in a poll conducted by web-based www.citysearch.com. The October 31, 2003 issue of the Sun Sentinel Newspaper ranked Tom Jenkins Bar-B-Que as one of the top restaurants in Ft. Lauderdale. The restaurant receive 3.5 stars and rave reviews for its, house sauce …so beautifully balanced between sweet and vinegar it tickles the palate with a wonderful combination of spice and sorcery. Fine Dining writer Judith Starks stated in the article that Tom Jenkins Bar-B-Que as “Barbeque at its juiciest, smokiest, heart-throbbing best”, She went on to tout the charms of the restaurant and to praise other menu items from the baked beans to the sweet potato pie. When in Ft. Lauderdale be sure to visit Tom Jenkins Bar-B-Que, a place where, according to Ms. Starks you go “for affordable delicious food”. Word about the delicious taste of Tom Jenkins BBQ Sauce is spreading. 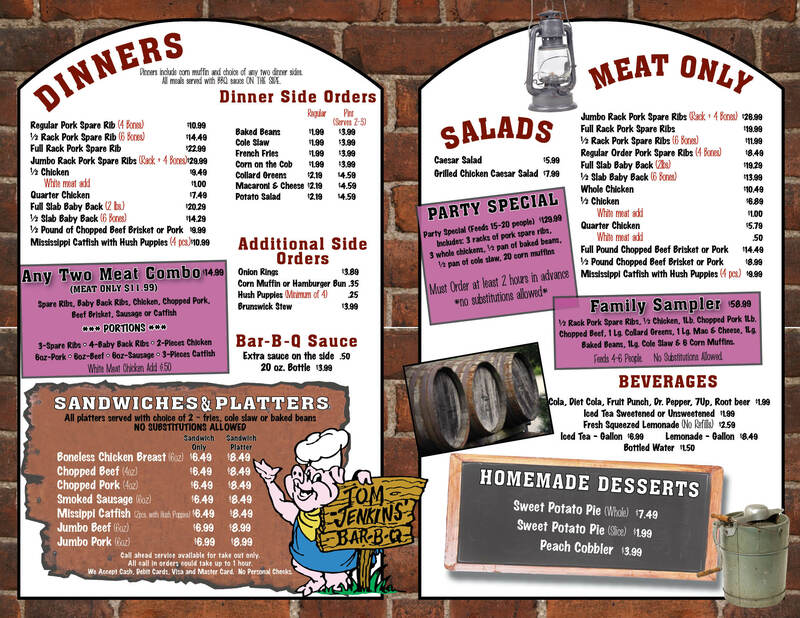 Rhythm Magazine, a Hot 105 Publication, profiled Tom Jenkins Bar-B-Que in its February 2004 issue as one of South Florida’s flava-ful African-American owned restaurants. The article described the restaurant as a “full-scale, sit down, roll-up-your sleeves restaurant, with “a sauce that’s out of this world”. Tom Jenkins Bar-B-Que has become a staple in the Ft. Lauderdale area as one of the must-go-to places for ribs, collards and macaroni and cheese. There’s a reason Tom Jenkins’ Bar-B-Q has become a Fort Lauderdale institution. Inside that tiny ‘cue hut, the tables are made of a few old wooden benches and the room is filled with smoke. The line is almost always long, and the staff is perpetually in motion, chopping pork and slicing ribs to meet the demand. The air is sticky and thick, like the joint’s famous sauce, and it’s impossible to visit and not leave smelling like barbecue. Some people may pine for Tom Jenkins’ meaty St. Louis-style ribs; others go crazy for the pork sandwiches and the expertly made Southern sides. But the brisket calls to us above all else. It’s chopped, not sliced, into thick, meaty hunks. The cut provides a little bit of charred exterior (often called “bark” in ‘cue circles) along with a smoky and moist interior. It’s so tender and flavorful thanks to hours in Jenkins’ open pit that it needs no sauce — though a little dab won’t hurt ya. Any time is a good time for a bit o’ that brisket. Just remember — Jenkins’ is closed Sundays (“gone to church”) and Mondays (“gone fishin”). Broward New Times 2011 – They like the lunch… a lot! 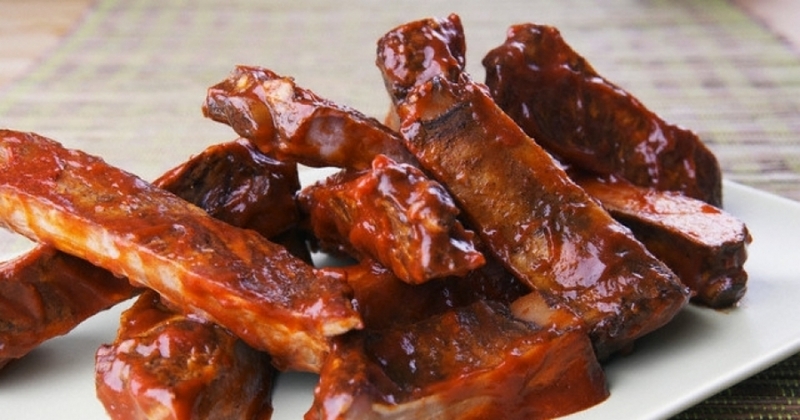 Smoky ribs, pulled pork, and chicken hit the mark here, having earned a handful awards in our area not known for ‘cue. Yet it’s the character that draws regulars. Housed in a log cabin off South Federal, you’ll often find yourself in line waiting for meat dressed in a molasses and honey spiked sauce. Not a meat eater? Collards, mac and cheese, or a Mississippi style catfish sandwich should do the trick. Or go straight for dessert, like a slice of sweet potato pie.